A few weeks back, I talked about how "If You Were With Me Now" by Kylie Minogue and Keith Washington shattered most of the illusions I'd had about duets. If any song had given me those illusions then it's the collaboration that debuted on the ARIA singles chart this week in 1987. The song featured two of the best vocalists in the world, who looked like they'd been friends for years and thought it'd be fun to sing together. I know now the duet wasn't quite what it seemed but my 12-year-old self had no idea of the record company machinations going on behind the scenes. At number 1 this week in 1987, "You Keep Me Hangin' On" by Kim Wilde took over from "Walk Like An Egyptian" after just one week - but the chart battle between those two singles wasn't over yet. Fresh from his Grammys success, Steve Winwood continued to make the US top 20 with ease, but this almost title track from Back In The High Life was nowhere near as big locally as "Higher Love". This genre-blending track with an extended spoken tirade towards a cheating girlfriend had made the US top 10 and been one of the first big hits on the fledgling Def Jam record label. After the disappointment of "All I Want", this second single from One To One was a step in the right direction for Howard Jones - both musically and in terms of chart success. But even though it was a much stronger track, it still didn't return Howard to the ARIA top 50. "You Know I Love You... Don't You?" did much better in the US, where Howard still had a handful of hits left up his sleeve. In the UK, it was his first single to miss the top 40 - a sign of things to come. 1987 was a good year for Lime Spiders. After years of playing on the live circuit, the on-again, off-again rock band broke through with their first single for Virgin Records. "Weirdo Libido" was also the very first music video to be played on Rage when it premiered in April 1987 - a testament to their status as one of the hottest bands on the local music scene. Commercially, this was the pinnacle for Lime Spiders, who are ingrained in my musical memories of 1987, since they appeared in the Single Of The Week slot on the very first chart I collected. 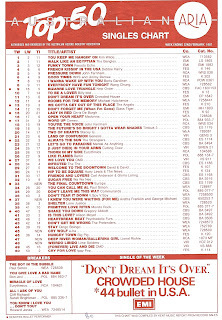 If one smooth ballad, "Love Will Conquer All", hadn't worked on the ARIA chart, then how about a double whammy? This double A-side single did venture into the top 50, but the country-tinged "Deep River Woman" (featuring Alabama on guest vocals) and the sentimental "Ballerina Girl" felt like the musical equivalent of cruise control. 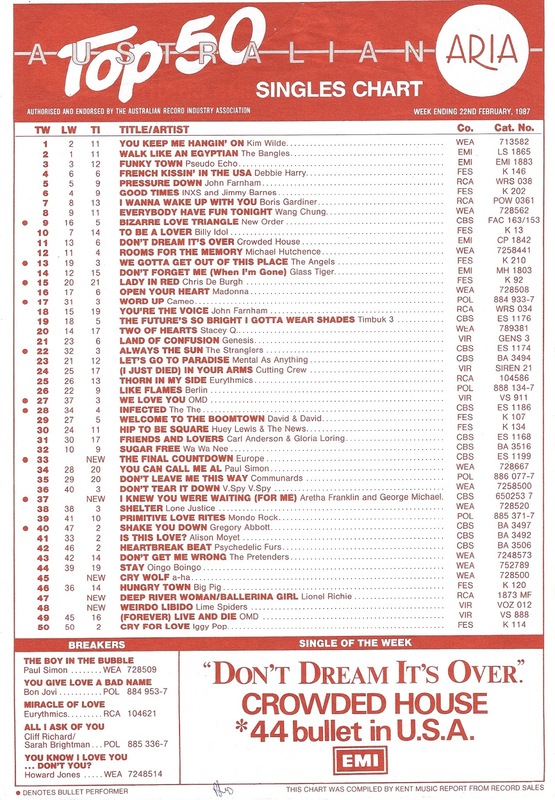 In the US, where they went for that sort of thing, "Ballerina Girl" was Lionel Richie's final top 10 single. As much as I love a-ha, even I was a bit underwhelmed by this second single from Scoundrel Days. A big hit in Europe, "Cry Wolf" was, for me, the Norwegian trio's weakest release to date - and charted accordingly in Australia. Follow-up "Manhattan Skyline" was also a bit of a disappointment and missed the ARIA top 100 completely. The band would be back on track later in 1987 when they became the latest act to record the official single for a James Bond movie. So far in 1987, some great singles had entered the ARIA top 50 - but they'd all been hangovers from 1986. 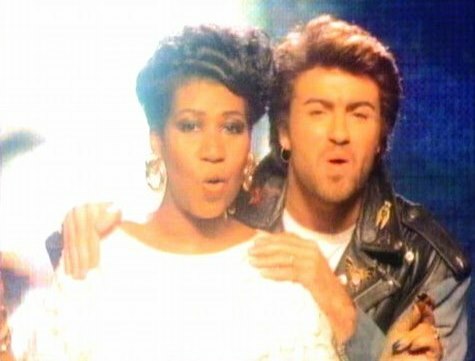 This duet between Aretha Franklin and George Michael was the first fantastic song released in 1987 - and it was flawless. Unlike most A-list pairings of the time, "I Knew You Were Waiting (For Me)" wasn't a big ballad taken from a film soundtrack. Instead, it was a perfect pop concoction that'd made an under-the-radar debut on Aretha's 1986 album, Aretha, where it remained while she released "Jumpin' Jack Flash" and "Jimmy Lee". No doubt, the delay was partly to allow a decent gap between George's final Wham! releases and his first single as a fully fledged solo artist. And the duet was obviously lined up to ease him into his post-Wham! career instead of jumping straight into his own album. Of course, he already had solo hits "Careless Whisper" and "A Different Corner" to his name, but this was the first time he'd put out a song without Wham! to go back to afterwards. If any singer was going to make the transition to solo stardom effortlessly, it was George, who held his own against Aretha on "I Knew You Were...", even towards the end of the song during some of the most memorable ad libs in pop music history. Not written as a duet originally, the song, which was pitched to Tina Turner as well, was turned into one at the suggestion of Arista record exec Clive Davis. George and Aretha recorded in the studio together - except for those ad libs - and by all accounts got on famously, something that comes through in the music video. That positivity - both from the song and the chemistry between the performers - made it irresistible to music fans the world over, with the single topping the Australian, UK and US charts. It was George's third career chart-topper locally - and it would by no means be his last. For Aretha, it was her first stint at number 1 in Australia and would also be her final appearance on the ARIA top 50. Can you listen to this song now and hear anything but a world-conquering smash hit? Swedish hair metal band Europe didn't think their signature track would be successful and only had in mind that it would make a good opening song for their concerts. The title track of their third album - their first release on Epic Records - "The Final Countdown" was based on a keyboard riff singer Joey Tempest had written years earlier and filed away. Thankfully, the band listened to sense and were convinced it should be a single, one that would go on to top charts around the world - except in Australia, where it spent four weeks stuck at number 2. Next week: want more hair metal? How about the chart debut of the biggest band in the genre. Plus, the latest hits from Dead Or Alive and Eurythmics. I didn't know the Howard Jones song, and I don't love it. I can picture Tina singing 'I Knew...', though probably not with the same musical backing. I loved 'The Final Countdown'. I remember someone commenting on it somewhere ages ago that it was really a dance song disguised as a rock one, with the synth hook. It's strange that Kim Wilde had a #1 in Australia and the US but not the UK. Hmm your right Nathan. You keep me hangin on should've easily cracked the pole spot in the UK for a couple of weeks but not to be unluckily. She came close also with Kids in America at 2 & You Came at 3, both excellent hits. Yeah I haven't heard of the Howard Jones song either. What is Love is probably his most recognised & easily his best hit, despite reaching a mere 31 locally. I don't mind Lionel Richie but for some reason don't like Ballerina Girl, perhaps I haven't heard it a whole lot. I knew you were waiting would easily be my song of the week. Great collaboration between a massive female star for the past 3 decades prior to this tremendous hit & George Michael who needed the credibility & confidence to make the conversion swifter to the massive Faith album. I LOVED 'Knew you were waiting'. I am amazed there are any grooves left on my 7" copy as I played it so much at the time.